What is loud and fast and always a huge attraction? The Ohio Cobra Club’s annual London Cobra Show held in conjunction with the London Strawberry Festival. At 9 a.m. June 27, Cobra drivers will parade into London. They start at the Speedway gas station at U.S. Route 42 and I-70, turn west on U.S. Route 40, then turn south onto State Route 56, wheeling into downtown London two abreast. They will park at North Main and High streets, where from about 9 a.m. to 3 p.m., the public can get a close look at the vehicles, talk to the owners and browse through vendor booths. Visitors will see Cobras, Daytona Coupes and GT40 replicas. For people who want the full fast-car experience, speedy charity rides are available. 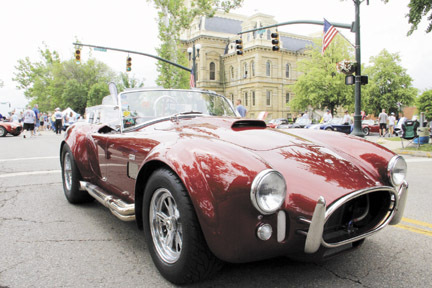 For $10, a person can climb into the passenger seat of a Cobra car and enjoy a one-eighth-mile ride down Main Street. The vehicles go 0 to 60 miles an hour in about four seconds. For those who want a chance at owning a Cobra replica, the club is raffling off a 20th Anniversary Superformance kit car built by club members. Tickets are $20 and can be purchased at londoncobrashow.com or in person at the show. Online ticket sales close at midnight on June 23. The drawing will take place the evening of June 27. The club also is selling London Cobra Show t-shirts. Anyone who takes a charity ride receives an “I Smoked ‘em on Main Street” t-shirt. Proceeds from the charity rides, t-shirt sales and car raffle benefit the Cystic Fibrosis Foundation. For their efforts, the club has received the Foundation’s Breath of Life Award. “We’ve been doing this for 14 years now, and we’re close to giving a total of $1 million to the foundation,” Beck said. Go to londoncobrashow.com for more about the show, part of a multi-day gathering of Cobra enthusiasts.